Solid surface cleans easily with soap and water. Most household cleaners are also safe for solid surface. 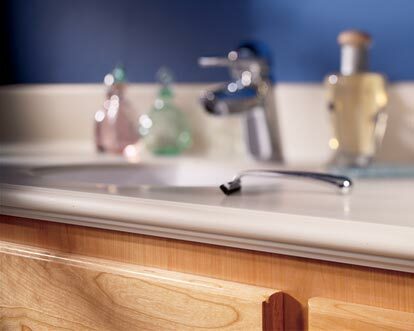 Solid surface does not absorb food, odors or bacteria. Integral bowls and built-in coved backsplashes can be fused to the countertop to create a water-tight and bacteria-free transition. Because it is non-porous, solid surface does not absorb moisture, which makes it the perfect decorative surface for wet environments.